Yesterday morning, bright and early, straight after the start of the school term drop off, I met up with my garden designer friend Lisa Cox at Wisley. By the time we'd got our coffees at ten to nine, we needed to join the back of an already expanding queue of keen flower show enthusiasts. I was there to see if I could find some unusual beauties to add to my flower farm (or garden, or both) and I have to confess to coming away with a full truck and an empty pocket. Although I'll admit to being a tad dissapointed at finding Some very bought in plants on display yesterday, (I hastely put down a Hypericum I was interested in when I saw the dutch market lablel)- most of the Nursery stalls are run by growing enthusiasts, who can tell you loads about what they have, where they can grow, and which is the best for you. Floyds Climbers and Clematis were are great example of that, - The Princess Kate Viticella Clematis (pictured above) was the centre of attention, but he talked me through new Passionflowers - (I bought one called Silly Cow), - and suitable climbers for cutting, and suggested further sources for information to research. - They've got an open day on the 14th & 15th of September if you're near Lackham College. I also invested in some rather lovely Salvias, - Late season colour is always important, and i've got blue's so I thought this Peach Parfait would go rather well too. and of course Being September, there were bulb companies showing off their wares. I'll be looking for some of these in the coming season. The weather is great for walking in the gardens too, so i'm sure that Wisley will be extremely busy this whole weekend. - If you want to be inspired by flowers, then do go along early, - otherwise, my advice is to avoid the whole area. It's the last day of the year, - The rain is falling (again) and the boys are doing their own things (fishing and watching Horrible Histories!) so i've been tidying my desk and reviewing what i've been up to this year. It hasn't seemed like a hugely busy year in 2012 (although the figure say i've been bucking the recessional trend)- I've managed to do plenty of Mum things as well as running a business, but looking back over the year, i've covered a lot of ground. I've talked to 14 groups in 2012, Wi's, Gardening Societies and the National Vegetable Society. My most requested talk, was Designing for colour in the garden all year round. Followed by - Herbs for the kitchen from your garden, and Gardening for wildlife. I was warmly welcomed by all, and it was wonderful to see the interest in my topics, even if i've yet to find a group that have gardeners that know what their soil pH is! I did 7 consultations for clients this year. Walking them round their gardens, telling them about the plants health and positioning, plus giving them design advice and suggestions of plants and products that will save them time and money. - This is fewer than in previous years, but as I did 9 Planting projects, some of them with 2 or 3 borders, it balanced itself out. You can see some of the projects that I did, like Mediterranean borders, or a Garden next to a main road, or a Raised bed border on the border planting catergory of the blog, - and i'll be going back to them next year to get more photos to update you. I also got a Christmas card saying that I should go and look at a landscaping projects that's been completed for a design that I did, - something for the new year when it's drier. I also did lots of maintenance with the help of Helen and Paula, of projects that we've completed over the last few years. - Going back to them on a regular or even occasional basis is great to see how they are growing into their spaces. Keeping weeds under control and propagting plants to fully fill borders is something that is very rewarding, but pretty hard work, - so i'm grateful of the company while I weed. So 2012 has been a really good year for me. I spent 2 weeks cheering and crying at the Olympics, I've eaten fresh food from my garden and allotment every week this year (it got a bit close in early June, - but herbs and salads covered the gap!). I've had great support for my business from my family, friends and clients, (thanks all) and i've built a network of fantastic local and social media business friends that help when I come up with interesting, mad and new ideas for next year, - and i'll tell you more about that in 2013. Today I found myself, in the first week of halfterm, with an unexpected morning of childcare, and a few hours not assigned to a client garden. So I jumped on a train up to London and took myself off to the Horticultural halls to the RHS's Shades of Autumn Show. The hall was very colourful, with not only Autumnal shades of flowers and Foliage, but hangings decorating the hall. I wrote about my visit to the February show with my son in tow, which I really enjoyed, but without him being there this morning, I could ask questions about the things that have been puzzling me this season. I managed to talk to stall holders about Chrysanthemums (should have cut mine back in July, that's why they are long and leggy). Chillis, - apparently my fave Cherry Bomb isn't available any more as its been bought by monsato, - and I should leave the rest of them on the plant to ripen as they won't do as my tomatoes have done and go red on the window sill. I also introduced myself to the Plantagogo Heuchera gang, who I know through Twitter, and discussed Vine weevil and how to get them to reroot if the little blighters have eaten the root ball off. Plus I had a lovely chat about Dahlias, which I think are my new favourite plant, and I think will definately be, if the advice I've been given gets my plants through the winter and flowering again next year. A very successful morning and worth the hours spent playing Monopoly yesterday to get a while to myself. Last September, - you might remember that my family were allocated a rather special allotment. I havn't written about it much, - but that doesn't mean that we havn't been (regularly) working it, and harvesting our crops, - particularly to go with our Sunday Roasts. It's been a real family affair. - I've been down there on my own only a handful of time, - mostly it's all 3 of us. The rest of the volunteers at the Grace and Flavour garden (over the wall in the photo) also got to show off their acheivements and then in the best of british traditions, there was lots of tea and cake. Well done to Su and Bob for organising the day, and all the G & F community gardeners and allotmenteers for being there to show off what we've acheived in the last couple of years. 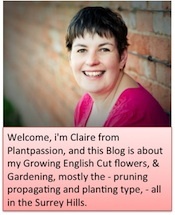 I'm going to admit to shamelessly pinching the idea for this post from Rona at Flowerona, who posts an update of her (always very exciting) week each Saturday. As i've been asked several times just this week, - what is it that you do?, - I thought i'd give you the behind the scenes look at the glamourous ! life of an expert gardener. During the winter, I get weekends with my family, - but as soon as spring appears, Saturdays are for seeing new customers and doing consultations in their gardens. Then I went off to see Mrs W, who i'd done a consultation and planting plan for last year, but life got in the way of completing the plant move. This is the border last year, - the aim is to add more height and interest later in the year, in a traditional cottage border style (without quite as much work) in pinks and purples. We reviewed the border in it's 2012 state, - we also talked through redesigning the herb bed on the other side of the garden. I then went to do a new Consultation for a couple very locally to me (I walked, that's the 2nd customer in the last 3 months that are soo close) They've recently had a deck built so that they can sit outside and enjoy entertaining friends. However at the moment the rest of the garden isn't much to look at, so we talked through the plants they have, what we can improve and move around, and i'm doing a planting plan for them to give the colour and effect they want at the edge of the decking. The key project for today was to take down our old greenhouse, to make way for our new one. As I wasn't quite tall enough to help without getting directed (shouted at) We called in help from our friends Dana Leigh and David, So while the guys did the greenhouse, we went and pruned some apple trees at Grace and Flavour - (yes in the rain, and I did moan incessantly, but we didn't stop until we'd finished) We then had a lovely lunch in front of the fire to defrost and dry out. Monday morning is almost always admin for me. I hate paperwork, so try to get it out of the way early in the week. Invoices, emails, phonecalls updating my website and blog are all monday morning jobs. Then I also found time to visit a couple of local nurseries for bits and pieces needed for clients this week, before pick up and my Son's swimming lesson. A regular gardening session today, - one of the 5 gardens I go to every month. This town garden has a very sunny side and a very shady side, and this was the first time since November the shady border had been defrosted, so I had a great session cutting back, weeding and pruning everything into shape. This was the garden I keep the ivy trimmed to its junvenile form. After finishing there, I had to dash across Guildford to take photos of a project that I gave advice for last year, where the hardscaping has now been completed. I took lots of pics so that I can plan the plants and trees for the borders, and the transformation that has taken place is amazing. Another regular client, and one where i've now developed 4 borders over the last 6 years. There are now plans to move the garden on even further, so a garden designer has been called in to give a big picture of how to change things. I was introduced to her today, and she seemed very nervous to meet me, saying she didn't want to take over, but i'm far too close to this garden, having been in it monthly for the last 6 years to come up with something completly different in a concept design. I'll get the pleasure of moving the current plants around into the new borders that will be created. Most of the session was made up of weeding, but I pruned roses, moved around some seedlings, and dug up some Asters that were creeping too close to the lawn. These will be potted up and sold at the plant fairs i'm taking part in May. I also planted up a container with some spring colour, using the fantastic homemade compost that's been brewing at the bottom of the garden. I then headed off to my local nursery to pick up an order - and off to my client for planting 2 woodland edge borders with Hellebores and Sarcococcas. Plus 2 trees to add to a border I planted there last spring. The 2nd tree took longer to plant than I thought (serves me right for getting a good deal on a multistemmed birch and upping the spec) but luckily Hubby was working from home, so did the school run. I got home just in time to gather up all my bits together for this evening's talk. - To the Southern Branch of the National Vegetable Society, about Herbs. It was just down the road in East Horsley Village Hall, so not far to go, and they were a very appreciative audience who also totally destroyed my preconceptions of Vegetable Society members being older gents with caps who grow Vegetables far too big to be edible. Friday is my gardening club day. I try and get in some exercise after school drop off, - but as i'm walking or swimming, i'm planning at least 3 activities of 10-15 minutes for each of the 3 age groups of children that I take. The first group at lunchtime is the reception children, - who are all very enthusiastic, but not terribly skilled at their hoeing, hole digging and seed sowing. The next group are the year 3's - 7 & 8 yr olds, who are by now worldly wise and think after 2 years they know all about gardening. I then get a break for a sandwich, and have an hour to weed, replant and harvest crops ready to sell to parents before group 3 (yr 1 & 2) after school. By 4.10pm when i'm finishing clearing up after 3 lots of activites i'm a lot more tired than when i've done a full day of gardening, - or is that just that it's the end of the week? This weekend, I said goodbye to an old friend. For the last 15 years, i've spent most Sundays, and quite a few evenings in their company, in the warm, enjoying my gardening. But now it's time to say goodbye to make room for a bigger more grown up friendship. For the last 15 years, my Alton Cedar Greenhouse has been my partner in gardening. It was presented to me with a big bow around it for Christmas the year we moved into our first house, we'd asked all our friends and family for money towards it, and still it bust our budget, but it was soooo worth it, and over the years it has produced plants worth many many times it's value. So at a time of year when most people have greenhouses full to the rafters, - i've had to clear mine out. My windowsills are full, - and i'm delaying sowing a lot of things as the new one should be arriving in 2 weeks. In the meantime, - the team from Wimbledon Garden services will be making me a new base and building the dwarf wall for my grownup plant house. i'll keep you updated with the progress.